The technique is using alcohol inks and a can of air. I just happened to have a can of air on hand so it was easier for me to follow along rather than having to blow through a straw. I really thought I was going to have to use a straw! For the base tag the colour kraft was used. 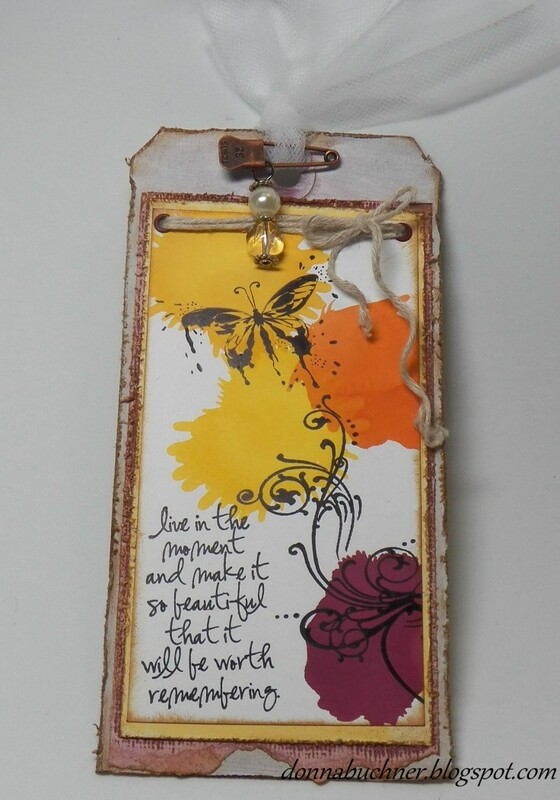 Once again I used my good old colour kraft file folders and my tag die :) I then white washed it with the picket fence distress ink. The alcohol inks that I used were raisin, sunset orange, sunshine yellow and butterscotch. I should also mention that the inks were used on Inkessentials specialty stamp paper. The edges were sanded, distressed and then inked with distress ink vintage photo. 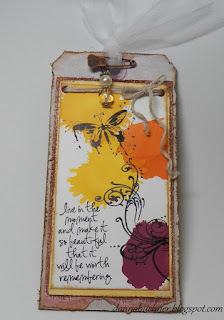 I layered using the Coredinations ColorCore Cardstock scattered straw and victorian velvet. Oooh, Donna. I TOTALLY L-O-V-E your tag!! This is an AMAZING creation, girl! The mixture of rustic with refined (twine, copper safety pin/black swirls and pearl) is SOOOO appealing!! The sentiment strikes a STRONG chord with me, TOO! If it were mine, I would pin it in my cubicle at work, as a constant reminder that life should have LASTING VALUE. Thanks, dear lady. I needed that.